Click to viewThe ESA is giving E3 another go in 2009, still trying to find the sweet spot between the ear-splitting boom of the old E3, the painful, panicked confusion of E3 2007 and the dry as dust E3 2008. With the most recent E3 Media and Business Summit suffering from executive and public criticism that the show was an unqualified dud, the ESA may be looking to shift the show back to early June, a time that industry planners think is a better compromise between the original E3 and the previous two iterations. It would not only give publishers more time to spread out announcements between the show and, later in the year, Games Convention and Tokyo Game Show, it would give developers time to ready more polished demos without cutting into the critical development time of the approaching holidays. The show is hoping to attract a crowd much bigger than the stripped down, dead in the water version seen this summer. Much bigger.Sources tell us that while the crowd probably won't approach the 60,000-plus that showed up at the last BIG E3, it would be as much as ten times the size of this year's show, resulting in tens of thousands of industry types plaguing the show floor. 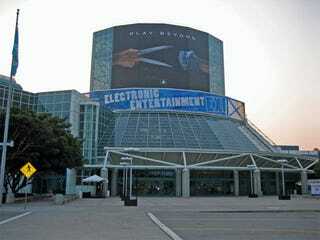 The show will remain at the Los Angeles Convention Center, we hear. However, the ESA may not have the pull to book the whole show, so it's possible gamers and attendees of National Retail Federation Loss Prevention Conference will be rubbing elbows between halls. The Los Angeles Convention Center is currently showing as unbooked for the first week of June, however, so the ESA may be able to squeeze its event in during that time frame. While it was unclear whether we would be seeing a return to booth babes, booming speakers, armfuls of schwag and flaming show floors with the advent of the new new new E3, it is clear that the new show will once more open its doors to the most "enthusiastic" of press. A bulk of those extra bodies packing next year's show will likely come from a broadening policy toward who is and isn't a legitimate media representative, with the invite-only policy potentially dropped. We've heard that it could be as open as allowing anyone with a blog to attend the show. This may not be the full on, open-to-the-public show that E3 really needs to stay in the game, but it leaves enough in the gray to keep the ESA's annual show's head just above the water. Hopefully, it's just one step in the direction of turning the show into the sort of event that would once more make it relevant by allowing the public to attend, something both Tokyo Game Show and Games Convention have done since their advent.